Gov. 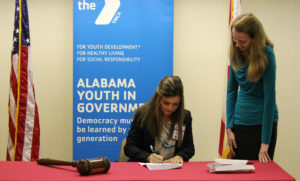 Claudia Hubbard signs SB22 by Katherine Voorhees into law. The bill also was named Senate Best Bill. SENATE BEST BILL: SB22, Reform Solitary Confinement Act by Katherine Voorhees, Spain Park High School, Hoover –Bans solitary confinement as a punishment for juvenile offenders and for those with mental disabilities. Limits solitary confinement for adult prisoners to 14 days. Signed into law. SB1 by Anna Hufham, Mountain Brook High School – requires grocers to donate unsold food that is unspoiled to charities and food banks. SB36, Rural Development Act by Addison Smith, St. Paul’s Episcopal School, Mobile – Under certain circumstances, grants businesses a $3,000 credit for each new full-time employee, and a $2,750 credit for each $50,000 net gain in qualified investment when they expand within a county with a population of less than 25,000. The credits may be used to obtain a refund of state sales and use taxes paid; against the income tax liability of the taxpayer; or as a refundable credit claimed on the income tax return. 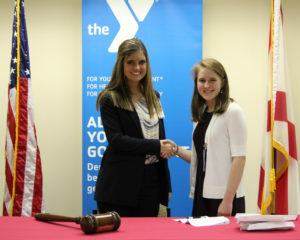 Signed into law. HOUSE BEST BILL: HB12 by Amanda Jones, Mountain Brook High School – bans cell phone use while driving. HB7 by Ella Hartman, Mountain Brook High School – requires “how to recognize human trafficking” training for rest stop workers, pilots, flight attendants, and hotel/motel employees. HB65 by Tyler Tannehill, Davidson High School, Mobile – nonpartisan judicial elections. Gov. Claudia Hubbard congratulates Virginia Cobbs after signing First Year Bill 2 into law. FIRST YEAR BEST BILL: FYB2, The Energy Revival Act by Virginia Cobbs, Mountain Brook High School, Birmingham – taxes bituminous coal, subbituminous coal and lignite at $1.40, $1.45, and $1.47, respectively, per 10,000 Btu of fuel. The tax proceeds are to subsidize energy research and development; provide grants for scholarships for nuclear engineering and research students; and fund grants and loans for companies building nuclear power plants and producing nuclear energy in Alabama. Signed into law. HB6, Rural Hospital Support Act by Chloe Kinderman, Mountain Brook High School, Birmingham delegation – a 25-cent cigarette tax to supplement Medicaid reimbursement to rural hospitals. HB67, Abolish Judicial Elections Act by Luckett Robinson, St. Paul’s Episcopal School, Mobile – creates a nonpartisan committee to select judicial candidates for Alabama’s circuit courts, the Court of Civil Appeals, Court of Criminal Appeals and Alabama Supreme Court based on merit. Gives the governor appointment authority based on the committee’s selections with approval of the Alabama Senate. 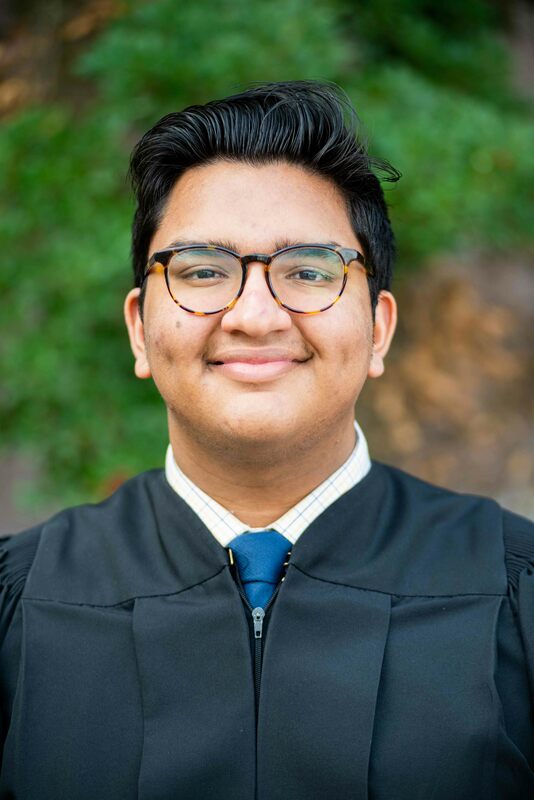 SB19, A Necessity for Any Life Act by Hayden Sledge, Mountain Brook High School, Birmingham – Public and private schools that donate leftover food to local shelters would receive a tax break that would be determined by the value of 15 percent of the donated food. SB54, Alabama Prison Reform through Drug Courts Act by Olivia Pride, Spain Park High School, Hoover – Requires each county in Alabama to establish at least two drug courts. FYB40, Recycling Routes in Alabama Act by James Snead and Easton Strickler, The Montgomery Academy – Requires recycling pickup service in every Alabama city with a population of 1, 000 or more manned by nonviolent prisoners. FYB11, Fund the Alabama Human Trafficking Task Force Act by Daniel Carmichael, Mountain Brook High School – seeks to combat human trafficking, coordinate strategies to prevent human trafficking and increase awareness through an apppropriation to the Alabama Human Trafficking Task Force. FYB71, Death with Dignity Act by Hannah Hale, The Montgomery Academy – legalizes physician-assisted suicide for those with terminal illnesses. Other photos of bill signings can be found here.